Hi friend! I hope you had a splendid long weekend and that September’s return to school and/or routine hasn’t left you with too much of the doldrums. 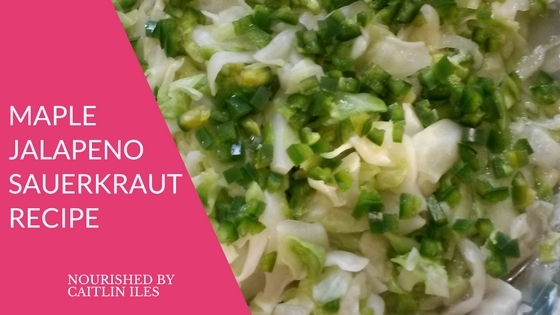 In the spirit of the impending fall season I thought I would share with you my new recipe for Maple Jalapeño Sauerkraut, which is a delicious fermented food chock full of healthy probiotics and a great tangy addition to salads, stir-fries, or meat dishes. While I was home on the east coast for a few weeks this summer I developed a real taste for the delicious, unpasteurized, homemade sauerkraut that was sold at my local market. However, upon returning to Saskatoon I found that one 1L jar of kraut cost over $8. Now I’m all for paying for quality food when necessary, but this just seemed ridiculous to me, so I hit up my local health food store and perused their sale produce and voila! I found a head of organic cabbage for 50 cents. My first experiment was in making regular kraut and when that turned out (I ate the whole 500ml mason jar in about 4 days), I decided to get whacky and thus three new kraut recipes were born. You can click here to check out my Gut-Loving Carrot Ginger Sauerkraut and my Super Powered Purple Onion Sauerkraut. Let’s check out some of the health benefits in our kraut! This pungent veggie is part of the cruciferous veggie family, along with broccoli, cauliflower, kale, etc., and so is a great source of sulphur rich nutrients that support your liver detoxification. Cabbage is also a fabulous source of vitamin C, which you need to build healthy skin cells and support your adrenal glands during times of stress. If you decide to use red cabbage in your kraut, which I highly recommend and not just because it looks so pretty, then you’ll also be getting a blast of the polyphenols called anthocyanins that have great anti-inflammatory effects in the body. These potent little peppers are another great source of vitamin C, making this kraut a skin-saving powerhouse! This vitamin also acts as a powerful antioxidant, which helps protect your body from the cell damaging effects of free radicals. Like other hot peppers, jalapeños are a great source of capsaicin, the compound that gives peppers their heat. So long as you’re not sensitive to nightshade veggies, this nutrient functions as a great anti-inflammatory and vasodilator that promotes healthy blood flow. Incorporating fermented foods, such as sauerkraut, into your daily diet is a great way to maintain proper balance to ensure glowing good health. Add jalapenos and maple syrup and stir to combine. Pour into a 1 litre mason jar and use the leaf you saved to push the kraut below the brine so that it stays submerged. You may need to add a little extra water to cover all the kraut. Seal and let ferment for 3-28 days. Once finished, place in fridge. If you notice mould, immediately discard your ferment. Do not try to remove the mouldy bit from the top thinking that it’s ok because trust me the mould has spread throughout the dish. If you notice something odd about your ferment check out this sweet troubleshooting guide to make sure you’re not needlessly throwing away your food. Well that’s my deliciously healing recipe for this week friend!